At 1000 UTC today, the safe buffer carefully built up by Groupama (Franck Cammas/FRA) had all but disappeared as PUMA Ocean Racing powered by BERG (Ken Read/USA) closed to within 10.5 nautical miles (nm). The leading two are fighting for premiership in the final approaches to the mythical Cape Horn, under 50 nm ahead, which will mark the end of 10 days of violent and typical Southern Ocean weather. 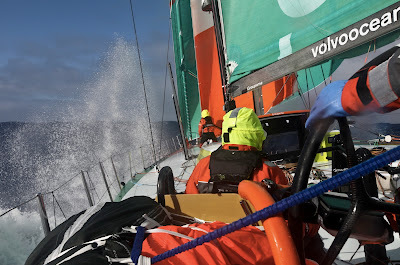 The wind has dropped between two low-pressure systems, which slowed Groupama and allowed PUMA to charge in at three knots faster. Ahead Groupama reported visibility of just 100 metres and rain and the speed of both boats has stabilised to around 20 knots. “We hope to see this famous rock, to mark the occasion…but if we don’t, then no worries, it won’t stop us from celebrating that. The most important thing is for the Cape to be in our wake,” reported Groupama’s Media Crew Member Yann Riou. Meanwhile, Team Telefónica (Iker Martínez/ESP), still clinging on to third place, had lost 11 nm and were 318 nm behind the leader as they continue to make careful progress, determined to finish on the podium in Itajaí. 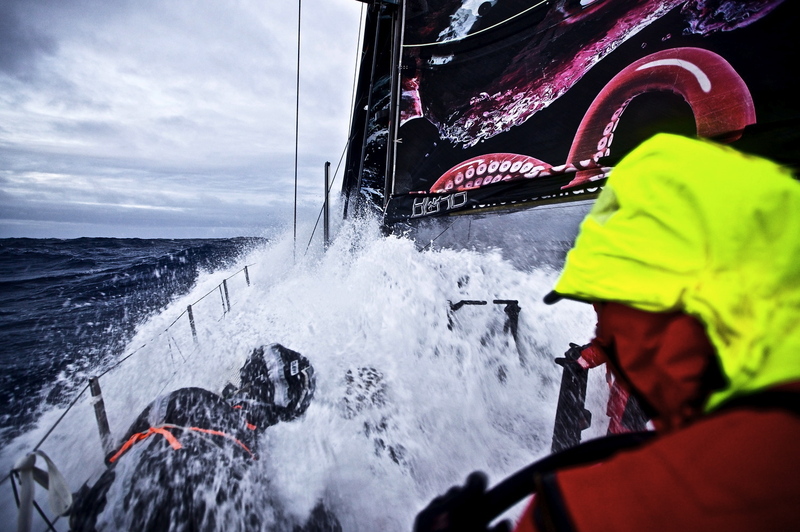 A further 1,674 nm from back in the fleet and alone, Abu Dhabi Ocean Racing (Ian Walker/GBR) acted quickly when the crew detected movement in one of the forward hull panels. The team immediately slowed the boat to assess the damage. More information will be issued as soon as possible. CAMPER with Emirates Team New Zealand (Chris Nicholson/AUS) are heading towards Chile, but have confirmed their intention to make a pit stop in Puerto Montt in around four days’ time.